(Nanowerk News) The genetic material found in cells is not in its free state, but bound to large protein complexes and tightly wrapped. To activate genes which might also play a role in carcinogenesis, the genetic material first needs to be unwrapped and made accessible for other cell components. Using a new biophysical method called single molecule spectroscopy, scientists from the Division "Biophysics of Macromolecules" at the German Cancer Research Center (Deutsches Krebsforschungszentrum, DKFZ) were the first to observe these mechanisms directly and to characterize intermediate stages on the way to free genetic material. Their results have recently been published in the Proceedings of the National Academy of Sciences ("Nucleosome disassembly intermediates characterized by single-molecule FRET"). 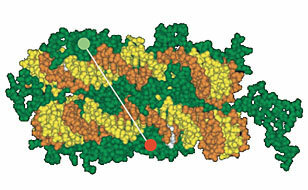 The DNA double strand (yellow and orange) is wrapped around a histone complex (green) consisting of eight subunits.Every cell of the body contains the genetic material DNA in its nucleus. Under normal conditions, DNA is not found in its unbound state, i.e., as a long, thread-like molecule, but packaged into a compact structure. The DNA is wrapped around protein complexes called histones to form a structure that resembles a pearl necklace. Scientists call the smallest packaging unit of DNA - one pearl of the necklace - a nucleosome; a nucleosome is made up of eight histones and the DNA bound to them. The DNA double strand (yellow and orange) is wrapped around a histone complex (green) consisting of eight subunits. To ensure that basic processes such as DNA replication during cell division or the translation of genetic information into proteins can happen without problems, the appropriate enzymes need to have free access to the genetic information. Therefore, it is vital that the genetic material can be transferred back from its compact form into a form that is easier to access. To make this happen, the cell regulates the binding of DNA to the histones through chemical changes in the histones. Thus, these changes influence both the structure of the genetic material and the function of the cell. Since activation and silencing of genes or oncogenes, respectively, also depend on the order of packaging, these chemical changes are supposed to play a central role in the transformation of a normal cell into a cancer cell. When a gene is activated, the DNA is unwrapped from the histones and the protein complexes can disassemble into smaller subunits; the nucleosome opens up. During the reverse process, when the nucleosome closes again, the individual subunits of the histone proteins assemble and the genetic material is wrapped around the histone protein complex. It was not until recently that it became possible to study such processes directly in single proteins and DNA molecules. Single molecule spectroscopy is a modern analysis method which uses a laser beam with a focus of a thousandth millimeter to 'count' and characterize molecules one by one. The method makes it possible to analyze different states of biomolecules both in isolated form in the test tube and in living cells. Thus, scientists are able to observe individual steps of biological processes directly. Using single molecule spectroscopy, scientists in the team of Professor Jörg Langowski of the Division of Biophysics of Macromolecules at DKFZ have observed the mechanism which leads to unpacking of DNA and, thus, activation of a gene. They discovered that the genetic material is released off the protein complex in a stepwise process and the protein complexes disassemble gradually. The researchers were able to characterize several intermediates during disassembly of the histone proteins so that they were able to describe these processes in detail. They succeeded in directly detecting the intermediates which form during the opening of the nucleosome. These findings are important for understanding the mechanisms by which genes are switched on and off through changes in the histones and might help to answer the question of how oncogenes are activated. This also offers a target for developing anti-cancer drugs, several of which are already being tested in clinical trials.